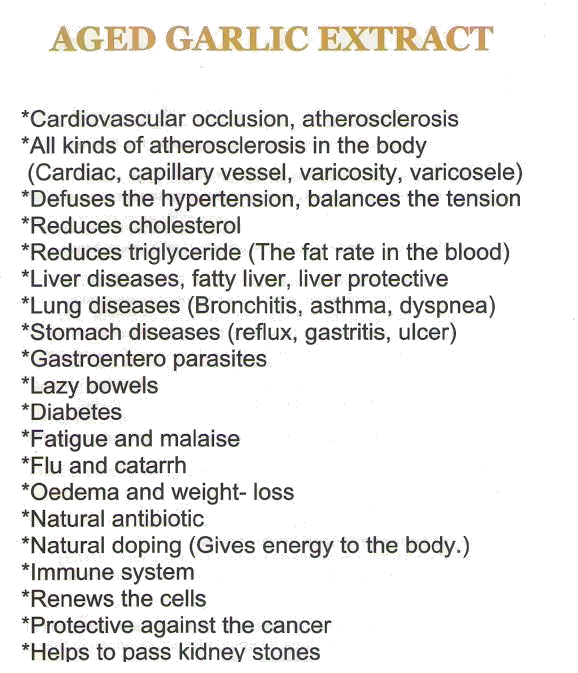 The AGED GARLIC EXTRACT or ELIXIR can be used as a proudct that everyone should use over the afe of 30-35, which it strengthens the immune system and protects the body against diseases. At the same time, for centuries, humans observed the effect of garlic, humans observed the effect of garlic, vinegar and lemon and aged this mixture to a characteristic known as youth potions. The most important feature of our mixture is that quality and price of the garlic, which has been waiting at least 48 months, inereases over the years. 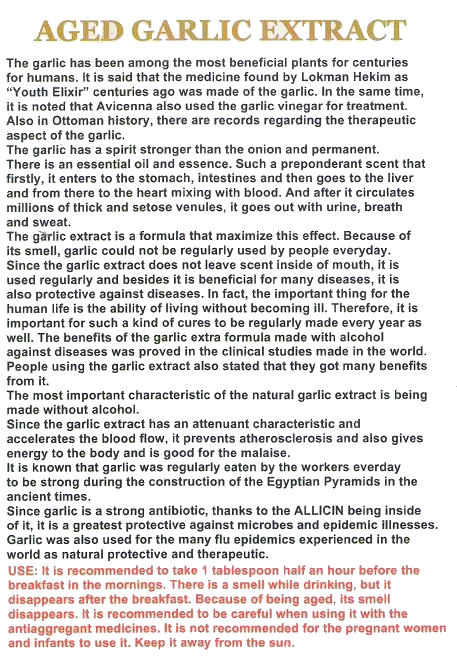 The mixture which is known as AGED GARLIC EXTRACT in Europe and US made by distillation in alcohol and has been proven to benefical by conducting clinical studies on it. But we make the mixture without using any additives, active substance and alcohol. Only ingredients are garlic, apple vinegar, lemon and water. Then the mixture is fermented and aged in special conditions to make product ready and perfect. AGED GARLIC EXTRACT is effective and helpful in diseases such as vascular occlusion, hypertension, cholesteroland triglycerides. Keeping the mixture on special conditions and allowing it to aging; soften the taste and this prevents it from harming the stomach and intestines. Aging process protective molecules for liver and at the same time increases the value of the product. And the one of the most important feature of the product is; it does not leave breathe odor.